The nine-banded armadillo(Dasypus novemcinctus) recently arrived on St. Catherines Island. The species was first seen on the island a decade ago, but has become more evident in the last three years. 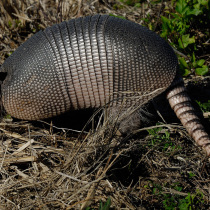 While native to North America, armadillos only recently invaded the southeastern United States. 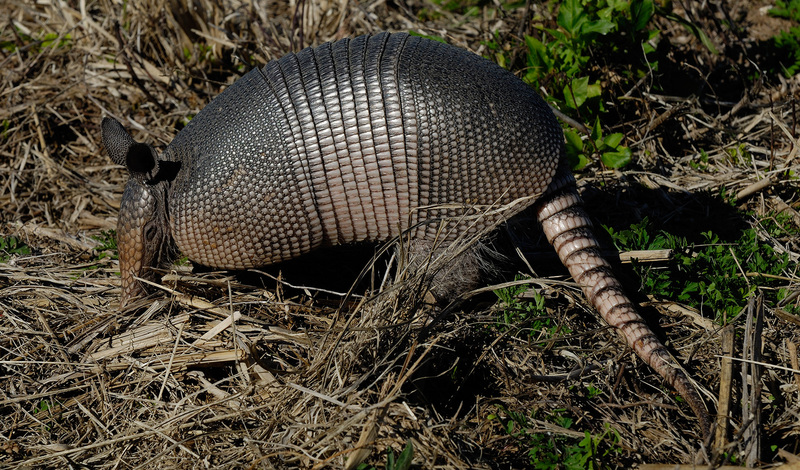 Before the 20th century, the nine-banded armadillo was only known in southern Texas. Since that time, the species has expanded its range rapidly throughout the southern United States. The coastal plains and barrier islands of Georgia were invaded because of the expansion of the species’ range in Florida. The invasion of this species throughout the southeastern U.S. is attributed to habitat modification, removal of large carnivores, and warmer climate conditions. Throughout its range, the species occurs in a wide variety of habitats, including pine-dominated forests, mesic hardwoods, scrub oak, and maritime live oak. It also occurs in grasslands, agricultural areas, and orchards. The species is an opportunistic insectivore that feeds primarily on invertebrates in soil, litter, and decomposing wood. How much it alters populations of these invertebrates is not known. The species also consumes bird eggs, reptile eggs, reptiles, and amphibians. In coastal environments, armadillos have expanded their diet to include beach-nesting turtle eggs, which is regarded as a learned behavior, and they are known to excavate the nests of gopher tortoises. Recent range expansion and distributional limits of the nine- banded armadillo (Dasypus novemcinctus) in the United States James F. Taulman and Lynn W. Robbins, Journal of Biogeography (1996) 23, 635- 648. Radiotelemetry Studies Of Armadillos In Southwestern Georgia, Daniel Gammons, thesis, University of Georgia, Athens. J.O. Whitaker, C. Rukdeschel, and L Bakken. 2012. Food of the Armadillo Dasypus novemcinctus L. from Cumberland Island, GA. Southeastern Naturalist 11(3): 487-506.